You are here: Home / Guides / What Does Alarm Clock Icon On An App Mean (iPad)? What Does Alarm Clock Icon On An App Mean (iPad)? You have seen this alarm clock badge (or icon), see the image below, on an app in the dock on your iPad and you are wondering what that exactly means? It is probably troubling you because of these reasons (a) you did not place the app in the doc, so why is it there, why it is placed there? (b) why does it have this alarm clock icon? This article explains what the little alarm clock icon on an app means and how you can disable it. See also: Crescent moon icon? 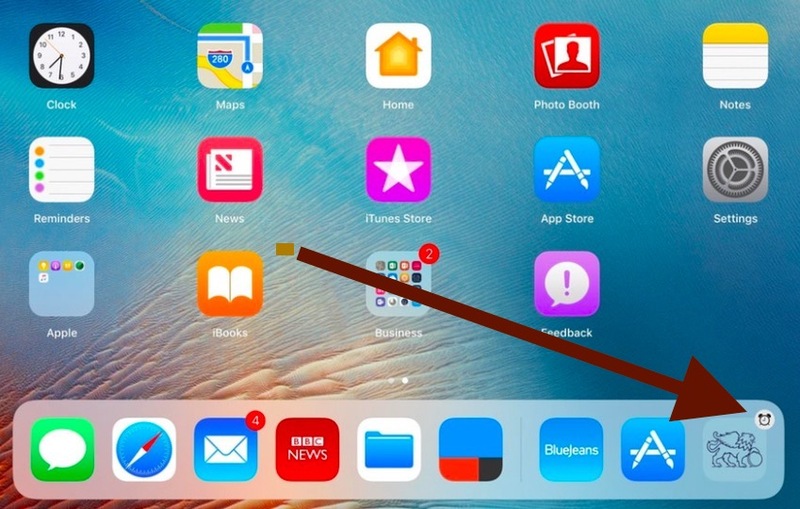 The new updated iOS brought a much improved user experience to the iPad, including a new dock. The new iOS uses complex algorithms to learn your habits. iOS (and Siri) has learned that you often use this app at this time of the day. iOS has further learned your previous usage patterns. Based on this information, iOS is trying to make it easier for you to use this app by placing it in the dock on the right side so that you can easily open this app. Siri thinks you want to use this app. It is simply a reminder kind of thing. It does not have any other function. iOS will suggest apps based on your app usage habits. For example, if you use the Facebook app everyday at 5 pm, the Facebook app with alarm clock symbol will appear at the far right of the dock. The clock indicates that that you have used the Facebook app before at this time, so iOS is suggesting that you may want to use it again. and then toggle off “Suggestions in Search” and toggle off “Suggestions in Look Up”. See also: Siri not working? the suggestion on how to turn off this annoying feature does not work. That’s the ONLY solution I’ve found that works to get rid of this annoying “feature”.. This is still not working for me. I have everything turned off, but I still get apps in dock and clock fave in upper right corner. I want it off, and nothing I’m doing from suggestions work. Thank you, Pew. What an awful feature. Dude i cannot find out what it the FR. Explain pls. THIS WORKED! What an annoying feature. Thanks Apple. Thank you! This was so annoying ! Finally! A suggestion that addresses the true issue. Thank you! Thank you!!! !I have a classroom set I have to fix. I can have my students help with your method! It really worked. Well done. Also a big “thanks” from me. Worked (after i rememberd to confirm the changes)! Thank you. The give solution also means the app won’t. How can one turn off ONLY the alarm clock showing in the app icon please. Great relief to find a fix for this intrusion from Siri, however, I have followed all the instructions shown and the problem still exists. I have also done a reset in my iPad Air and problem not fixed. I hope a fix can be found soon, as it is extremely annoying and definitely not needed. I have been on to Apple about the Doc app issue with Siri and THEY can,t even solve it. Everything connected with Siri is turned off and it makes no difference. It seems to be stuck on the Photo’s App, with Alarm clock on it. 12.1 update has made no difference. I am quite capable of choosing what I want, without Siri making decisions for me. So darned annoying ! Your iPad or iPhone is likely rooted and gathering analytics. Someone is personally gathering your information. They have locked down what they want locked down. More than likely your device is uploading to an iCloud account daily even if you don’t have one setup. Read up on the new software apple released for developers in July or August. I cannot remember the name right now. Let me guess. Are you on medical? Tons of info is being collected by education institutions. Yes and the thing I was all over was the old one. iCLoud backup data mining is up to you. If I was choosing, my preference is always best. Data analytics and tend development on each user is probably automatically analyzed. Thanks so much for your update, Apple. Now I cannot get this annoying alarm clock/app to close, no matter what “helpful” instructions I am provided to follow. yep it’s annoying and it won’t go away. Apple need to stop trying to be too clever. Really really really REALLY iritating ! When the calendar appears unwanted in the dock with an alarm clock icon on it the actual calendar app icon is just a few millimeters away where it should be. Why on earth would i want it repeated ? Have tried all the suggestions to turn this behaviour OFF but nothing works. Has anyone found anything that does work ? Put the app indside the doc and back it disapere. Try moving app icon into the dock manually, then moving it back out of the dock manually. This seemed to work! Bravo. This worked. Another useless stupid annoying, privacy invading feature. Instructions still don’t work and damn app icon with alarm clock is a fixed adjunct feature of my otherwise incredibly efficient and carefully chosen dock items. Argh. Update to latest iOS did not change anything. Put the app inside the dock and then take it out. If you’re trying to turn it off for a certain app try going to the app in settings and then clicking Siri and Search and toggle it off and do the second suggestion as well. That worked for me. If a particular app keeps popping up or you’re trying to turn it off for a certain app try going to the app in settings and then clicking Siri and Search and toggle it off and do the second suggestion as well. That worked for me. Did NOT work for me. It makes the Dock move & causes me to open the wrong app. Danged annoying and not at all helpful. Swipe over to your widget screen and remove Siri App Suggestions. Siri is trying to learn your habits and thinks that is an app that you regularly use. I have this problem too. What do you mean, swipe over widget screen? I did just what the thing said and it didn’t take the mini arlam clock off! NOW HOW DO I FIX IT!!!!!!! Completely useless feature that cannot currently be removed, have tried all the suggestions but none work. Many of the features Apple force us to have should be optional, many of the new features have not interfered with me but this one is annoying, please Apple remove it. If an app with the alarm clock icon continues to reappear, you must also turn off Siri Suggestions in the search screen (swiping left to right from home screen). This is also called the “widget screen”. It’s a Siri learning thing. The alarm/timer means iOS/Siri thinks this is an app you use regularly at a particular time of day. So, it sticks the icon of that app on the Dock around the time of day you use it. All in the idea this makes it easier to access. I had it doing that for the local newspaper and couldn’t figure out how to get rid of. It certainly wasn’t ”easier” to get at when the normal app icon for the newspaper was literally right above the Dock. Took a fair amount of searching around the web to find the correct answer. How to stop it. First, be on the iOS desktop. Swipe right to the widgets. Scroll the screen up if necesarry to see the Edit button and tap that. Tap the red minus button next to Siri so it stops trying to be so “helpful”. The timer induced icons should disappear. First, be on the iOS desktop. Swipe right to the widgets. Scroll the screen up if necesarry to see the Edit button and tap that. Tap the red minus button next to Siri so it stops trying to be so “helpful”. Remember to tap “Done” at the top right of screen. The timer induced icons should disappear. This works, thank you! What a dumb feature. Yes! Thank you Sharmaji!! Your suggestion is the only one that worked! Whew! Not a good fix. Still have that worthless clock and app. Hey Broski’s, i figured how, just drag a random app into the dock until you can’t add anymore to it and its gone. No room for sirirand friends to suggest anything. Thank you all, going to the “widget screen” did the trick, agree with everyone exceedingly annoying! I may have found the remedy. Go to Siri and Search. On the right scroll down till you see the app that keeps appearing with the alarm clock. Click on it. It will take you to Siri and Suggestions and below that Show App. Turn both of those off. I am hoping by turning off Show App it will disable that annoying feature. Rather a long string so I’ve gone straight to the end. I had the annoying clock symbol at top right of iPad screen which wouldn’t go away. I had no ‘alarms’ shown on the Clock app. Siri said “no alarms set”. I then went into the ‘Bedtime’ section of the Clock app and found that at sometime, I had played with it and the slider showed my wake up time for Sunday’s at 7.00am. I closed the slider and now all good! I didn’t think that the Bedtime bit was alarm….. If this feature isn’t removed on apples next update I’m gone to the new Samsung. FFS I am able to decide what I need to use without a dickhead designing a prick of a feature nobody wants. Useless irrational feature.